Background: The shape of the skull has varying degrees of convexity on its five surfaces. The forehead and sides of the head come closest to a flatter surface shape but the top and back of head has a well defined convexity to it. A flat top or flat back of the the head is a clear skull shape abnormality that is often bothersome to those so affected. The flat back of the head is the most common aesthetic skull deformity that is shared amongst both women and men. For women the flat portion is located more to the top of the occiput in the crown area. In men it is more often situated lower more towards the center of the occiput. They seek more outward projection rather than the superior-posterior augmentation of the crown. In looking at an increased posterior occipital projection for men it is important to appreciate where the central point of the occipital curvature is. It is actually much higher on the back of the skull than most think. It is located at or above a horizontal line drawn across the top of the ears. Case Study: This young male was bothered by a flat back of his head. His 3D CT scan showed an angulated flattening at the back of his head which created a high posterior sagittal ridge point. Of this he was not interested in lowering. 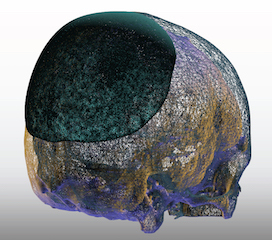 From his 3D CT scan a custom skull implant was designed to fill in the ‘missing’ part of the back of his head. The key to such designing is that the augmentation should look like it belongs there with a natural flow into the surrounding skull. Under general anesthesia and in the prone position, a irregular zigzag scalp was made over the nuchal ridge for 7 cms. A large subperiosteal pocket was made with the extent being where the edges of the implant would sit. The implant was rolled, inserted and unrolled once inside the pocket. Using the compass arrow marker on the lower edge of the implant it was positioned in the midline and secured with a single screw to the bone. For moderate skull augmentation on the back of the head a one stage immediate insertion of a custom skull implant is effective. The key in the design of the implant is to locate the exact portions of the flat back of the head to which the patient wants augmented. 1) One of the common head shape concerns in males is a flat back of the head. 2) The flat back of the head can exhibit various types of shape deformations . 3) For moderate flat back of the head augmentation (10mms or under) a one stage custom skull implant will be effective.